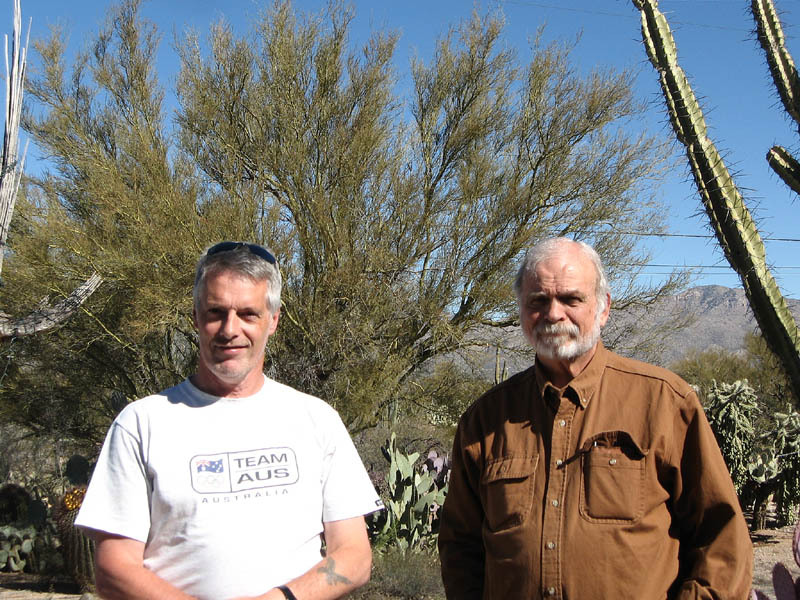 As you know from Steve Sorrel's (crocoite) photos in the macro forum, he was in Tucson AZ a couple of weeks ago to make a presentation at the Convention Center during the Tucson Gem and Mineral Show. Unfortunately I didn't make his presentation, but we did spend a delightful morning together. The photo is of Steve and I (Steve on the left) taken in my front yard. Ok, you cactus guys, how many varieties of cactus can you identify in the photo? Hi Gary, glad you guys got together. Tom Webster made tentative plans to come join me in Petrified Forest when I was there a month or so ago, but it didn't work out. Too bad you didn't get to see the presentation.